With a smooth ride to go with its asymmetric tread design, the Bridgestone Turanza Serenity is a popular option among touring tires. The all-season tread features a pattern that is not only attractive, but performs well on dry pavement, as well as wet roads, giving you added confidence in all types of weather conditions. Bridgestone has used a new L.L. Carbon technology into the tread compound of the Serenity tire that helps give it a much longer tread life, which is perfect for drivers looking to get the most mileage out of their tire purchase. Reinforced shoulder blocks provide solid handling. The Bridgestone Serenity ranges in price from a low of around $100 on 15″ series tires, to a high of approximately $350 on 19″ models. Who Are The Bridgestone Turanza Serenity Tires For? 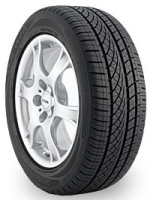 The Serenity grand touring tire is designed for drivers of all types of high performance luxury sedans or sports cars that are looking for performance and smooth handling. Bridgestone Tires provides a 5/year 70,000 tread life warranty on all H rated models of the Serenity. The warranty on V and W rated models is 5/years 45,000 miles. You’ll also get a 5 year guarantee against materials and workmanship, with free replacement the first 3 years and a prorated warranty for the remaining term. Bridgestone also gives buyers a 30 day buy it and try it guarantee.